Our guest host today is Cassie from Hi Sugarplum. 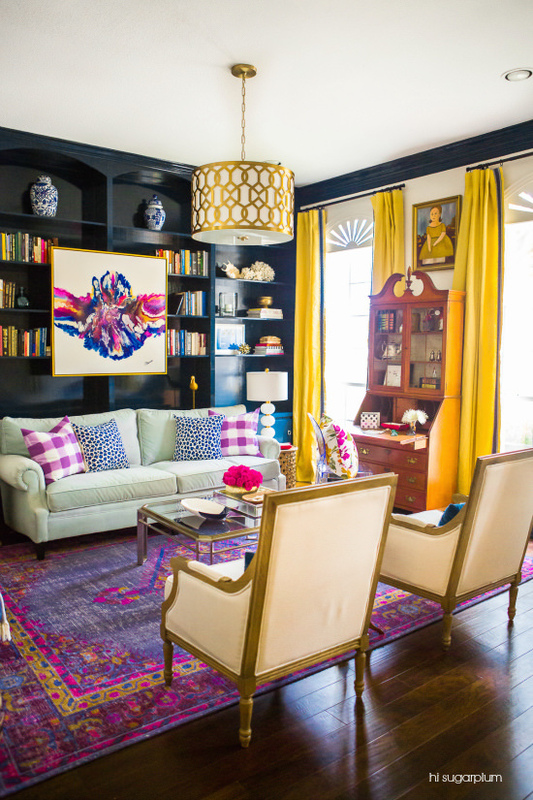 You know, the one that made us all drop our jaws to the floor with her living room reveal two years ago. I mean, is this room just fabulous or what?? We cruised together a few years ago, so I can vouch that Cassie is a sweetheart who is super talented not only in home design, but she can mix and match a mean outfit in a flash! She always finds the neatest things and I'm looking forward to seeing her gift guide today, too. ONE || Pom Pom Beanie Hat- This is on my personal list, I've wanted one for two years. It comes in 25 colors, but I thought the hot pink was irresistible! 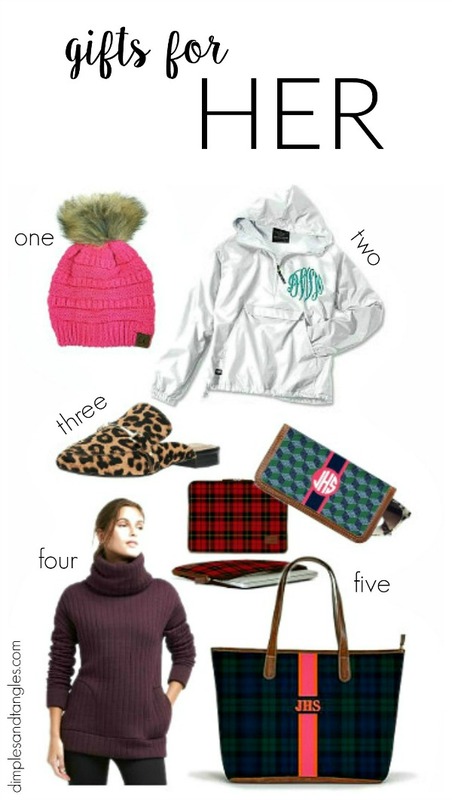 TWO || Charles River Monogrammed Jacket- great value for these personalized jackets, monogram included. My daughter has had one from this shop for a few months and absolutely loves it! THREE || Leopard Mules- I have just about every style of leopard shoes imaginable...booties, wedges, flats, pumps, sandals, sneakers, flip flops... so would I add these mules to my collection? In a second! I've always been happy with this brand and love the buckle detail across the top too. FOUR || Quilted Turtleneck Sweatshirt- Last year I bought 3 of these, and they are fantastic! They're perfect for chilly, even cold days. They are so warm and thick, long enough to cover everything, and the pockets are a bonus. There is a LOT of fabric on the neck to work with, but that makes it extra cozy. It comes in several different colors and I bought my regular size for a relaxed fit. If you want a slimmer fit like shown on the model, size down one. FIVE || Personalized Barrington Bags- I recommend these bags a lot, and for good reason! The quality is unbelievable and the options available are seemingly endless. The way I've used and abused my St. Anne Tote, I can't believe it's not long gone, but nope...still looks as good as new! I'd love to try the slightly smaller Savannah Zippered Tote, and if a full size bag is out of your gift budget, there are some nice smaller accessories too like the Monogram Eyeglass Case or the Laptop Case. ONE || Leatherman Multitool- always comes in handy! A winner for any age from older boys to Grandad. TWO || Portable Record Player with Blue Tooth Speakers- My husband just got one of these for his birthday. We've only had it for a few days and need to round up some records, but he's excited about digging through all of the oldies at his parents' house and bringing a few home to try. The blue tooth speakers are a nice added feature, and it's compact and easy to transport or store. 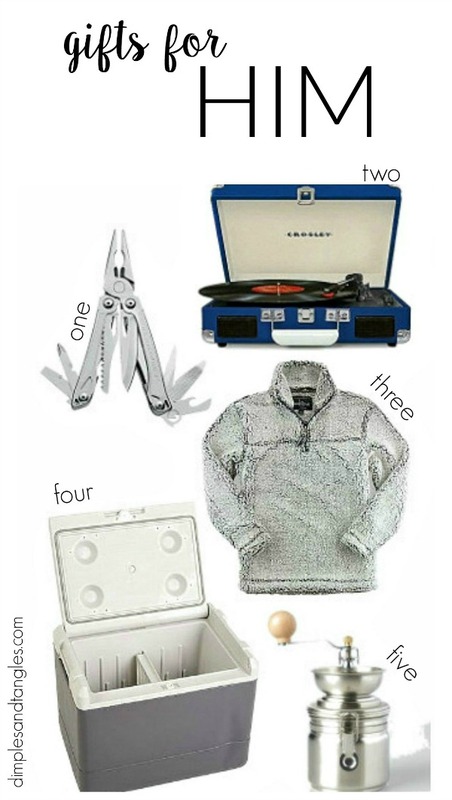 THREE || Sherpa Pullover Jacket- my (adult sized) kids are crazy about these jackets, but I'm sure any guy would love one too. Available in 4 colors. FOUR || ThermoElectric Plug-In Cooler- We take quite a few day trips, and this plug in cooler would be great to have in the car! No wet melted ice messes... it has a large capacity and can be used as shown or standing upright like a refrigerator. This would be great for families who are away from home all day at sports events, too! FIVE || Stainless Steel Coffee Grinder- Another birthday gift that my husband just picked out for himself. It stores any extra ground coffee with an airtight seal. He's not only enjoying it at home, but with it's smaller size is looking forward to using it on a camping trip one of these days! ONE || Getty Kids Hymnal CD- In Christ Alone or For The Cause We were privileged to hear Keith and Kristyn Getty lead worship this Summer at a conference we were attending. I bought these children's CDs and have enjoyed listening to them even though we don't have little ones. They are a great way to impart God's Word in the hearts of children and are calming and soothing, great for the car, home, or baby gifts! TWO || Spinner Web Swing- The vacation rental that we visited for Fall Break had one of these, and my daughter spent a great deal of her time on it. Lots of fun! THREE || Spikeball- A popular outdoor game anytime our teens gather. FOUR || Bungee Chair- Both of my kids have one of these chairs, and they love them. They're surprisingly comfortable and fold flat for storage. Along with using them around the house and patio, we cart them when we need to bring our own chairs for various events too. FIVE || Yahtzee Standard Version- Always a winner at our house, we play it all the time. The Rustic Version is a nice spin off of the standard, and this retro version is fun too! ONE || Custom Address Stamp- These are always nice to give or receive! THREE || Tabletopics- Another item on my personal wish list, I'd love to have these Conversation Starter Cards for meal time and when the kids have friends over. FOUR || Programmable Slow Cooker with Stove-Top Browning Crock- Yet again, this is on my list!! YOU CAN BROWN MEAT IN THE CROCK right on the stovetop, then slip it in the cooker for the rest of it's cooking time. No dirtying extra pans for browning first! It also switches the setting to "warm" when the cooking time is over, so your dinner is ready and waiting for you. 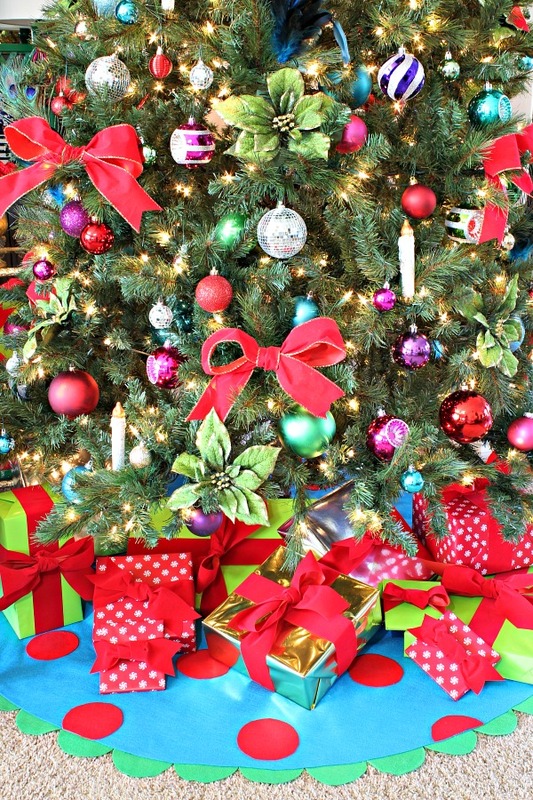 What's at the top of your wish list this year? 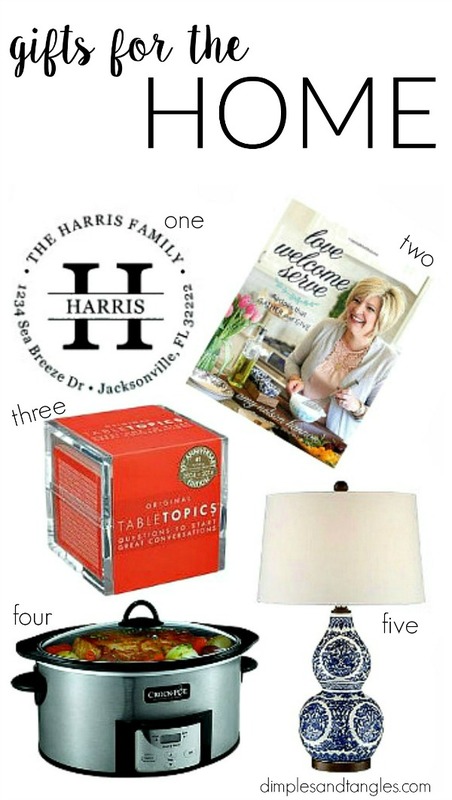 Be sure to head over to check out these great holiday gift picks, too! awesome lists! 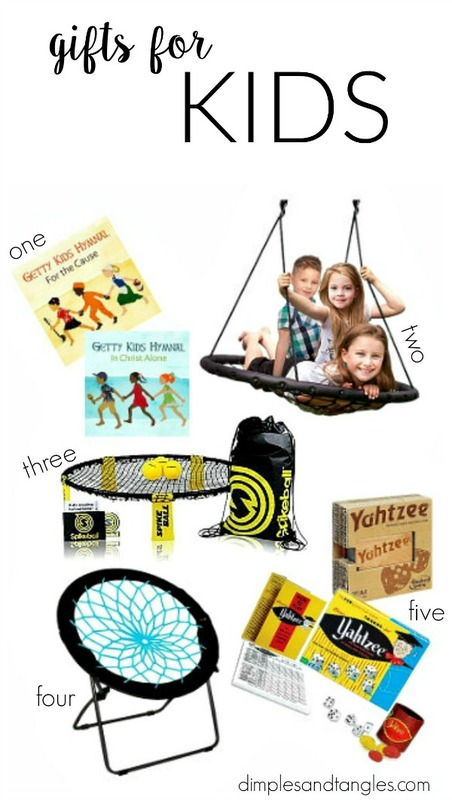 we have that swing and emmy loves it and yahtzee is on my list- it's a fave around here and ours is old and missing some dice! Spikeball is a great recommendation, especially for older kids who need to get off their electronics and get some fresh air!! My kids love ours and take it with us to the beach, BBQs, etc. I can't wait to check out your friend's cookbook, that looks amazing!! Haha! I have a few leopard print shoes too, but not those mules! Must remedy that! Love the Barrington bags too, so many cute options! Thanks for the great ideas, friend!